Tsume-ai implies a very specific form of martial arts, based on the Bushido code of conduct and principles of Budo. Conflict involves two fighters, where there is a presentation and overall physical and mental mindset in solving the outcome of the struggle by setting a single blow realized in the complete absence of judges and their subjective decision-making, which is, indeed, very often present in the arenas of karate. Judges, often managed by diverse interests, but also with the emotions or ignorance, can easily make victory into defeat and defeat other way around - unaware of the consequences that such a decision may carry on the contestants. Confronted fighters are in this case equal on the tatami as anywhere! It is a unique form of combat which cannot otherwise be seen in the entire world of karate styles and karate organizations and it is evident that this is specific form of combat, typical only in Fudokan karate. This essential form of appearance is the embodiment of the concept and essence of Budo and Budo skills demonstrated through a tradition of the samurai. This form of "conflict", that is, Bushido duel between the two fighters left to fate, two extremely determined samurai ready to receive the same calm judgment of fate, "when they need to live - to live and when to die - die," says the Prince Mito. In our case, in the 21st century, it is the duel of two competitors, but certainly not of any ordinary human, technical, physical or mental set, it is primarily the so-called level - Kurai! According to Sensei Nishiyama - Kurai is defined as not only the highest level of competitive spirit, physical fitness, but in terms of the total human potential. Competitors are extremely equally determined to take into their own hands the fate and outcome of the "duel". The outcome of the match cannot affect any outside factor or at least not a subjective judge decision. Judges are just silent observers! In the base of this happening - this form of martial arts, the overall age-old tradition of Bushido Code and Budo is woven into it. Way of behaving, thinking, conscious and unconscious phenomena of comprehending the environment - ourselves and opponent, expressed in a single postulate – in one principle, in one breath, the first and the last, which solves the same conflict. "One step - one death" - Ikkeu Shiatsu, prof. Suzuki would add: "On the uplifted sword that threatens to behead you and ends up your life - go forward and the gates of heaven will open up on you!" Certainly, the death is absolutely impossible in the conditions of the 21st century karate - they are extremely serious actions at the level of the subconscious knowledge but if the arms and legs would be replaced with katana - everything would be different! Civilized behavior, self-judging, does not give us the right to think of one point almost impossible and incomprehensible form of conflict today, where the outcome of one battle was the death of one or both opponents. In karate, judges can decide it is a draw in the outcome of a match of two competitors - Hiki wake. In Budo something like that absolutely does not exist! To be precise the dual blow of the katana of two opponents - only mean one thing - the death of both warriors. Life or death caused by the samurai crossing the "Bridge of Life" - as it is often emphasized in an otherwise scarce Budo literature where life or death ends on a thin thread - a fraction of the time, one breath or one step. Many forms of martial arts in the past, however, were ritual, revealing the inherent ethics, rules of conduct and moral responsibility. Over time, all that has changed, karate of 50s and 60s is completely different from karate in 2013 - not only in form, but the major content as well. Unfortunately, more and more and more honesty and fair play in action is suppressed. It was considered immoral and utterly condemning the act of weakness - showing and pointing to the violation of kicking or impressment in order to appear on the site of the blow - which would disqualify the opponent! Seriousness, courage, determination are suppressed, forgotten, simply anathematized, pushed into a different plan and by itself did not have any meaning. In Fudokan - on the contrary! Categorically in this form of combat - Tsume-ai, the Budo principles are performed to the full significance, not only as they are pronounced, but stand out in the form of postulates, the core of the art of fighting. As already at the end of 20th and beginning of the 21st century, sport and the rules of combat have rapidly changed, almost to the absurd - materialization, commercial effect, a number of experiments such as marriage of WUKO and Taekwando rules, all possible combinations and experiments, had only one effect and it was fatal. Karate is more and more moving away from its source. Undermining and destruction of the value of Budo in karate inexorably continues. Fudokan - and his definition of the terminology "House of stable grounds", was, is and remains the building block, the catalysts, simply put a form of connection with the Code of Bushido at one and Budo principles at the other side, without which the art of fighting itself would not be anything else than an innocent child's game. After the expiration of regular match time and extra extension (kettei-sen) the result is unresolved, that is without any awarded points, as the rule in Kumite the judges must the decide by ballot. In Fudokan the competition continues in the form of Tsume-ai. In case of Tsume-ai the judges return to their seats and Sushin declares Tsume-ai match. Sushin addresses to Fukushins by calling Hantei and Fukushins at that request of Sushin connect flags facing them to the ground. Sushin open hands at shoulder height palms facing out – summons the judges to himself on his left and right side - to continue his movement parallel to the front (similar like hitting tate shuto uchi), directs the two remaining judges to walk to each other and then all together go down in zazen facing competitors. At the command of Sushin - Hajime, competitors begins Tsume-ai fight - one attack. There is no limit in time for attack. The only requirement for wining is speed, strength, power, body dynamic, precision, distance and form. 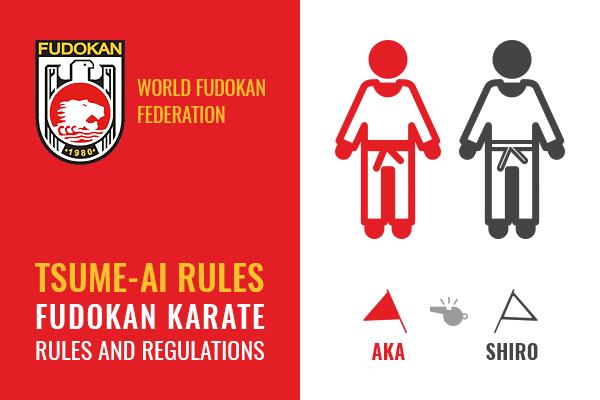 Regulamentul de karate "TSUME-AI RULES - International Fudokan Karate Rules and Regulations" by World Fudokan Federation, publicat in 2012, poate fi vizualizat sau descarcat si in format PDF accesand acest link. The Karate Fudokan TSUME-AI Rules according to World Fudokan Federation can be viewed as PDF accessing this link or you can order the book from World Fudokan Federation Shop.